On the first day of the Senate Judiciary Committee’s hearing on the nomination of Judge Brett Kavanaugh to be an Associate Justice of the U.S. Supreme Court, U.S. 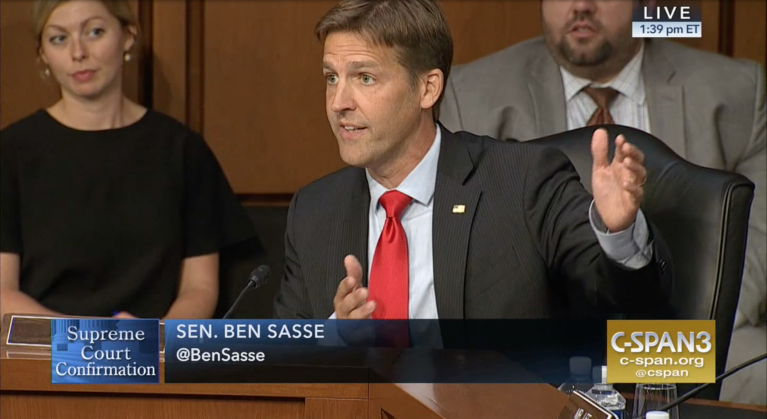 Senator Ben Sasse delivered the following opening statement. Senator Klobuchar, you did Madison, Lin-Manuel Miranda, the Magna Carta and your Dad taking you to court. Well done. I had all that on my BINGO card. I have little kids and I've taken my two little girls to court a few times too, mostly to juvie just to scare them straight not to turn them into attorneys. There's wisdom in Minnesota. Congratulations, Judge, on your nomination. Ashley, congratulations, and condolences. This process has to stink. I'm glad your daughters could get out of the room and I hope they still get the free day from school. Let's do some good news bad news. The bad news first, Judge: Since your nomination in July, you've been accused of hating women, hating children, hating clean air, wanting dirty water. You've been declared an existential threat to our nation. Alumni of Yale Law School, incensed that faculty members at your alma mater praised your selection, wrote a public letter to the school saying quote, "People will die if Brett Kavanaugh is confirmed." This drivel is patently absurd and I worry that we're going to hear more of it over the next few days. But the good news is, it is absurd and the American people don't believe any of it. This stuff isn't about Brett Kavanaugh when screamers say this stuff for cable TV news. The people who know you better, not those who are trying to get on TV, they tell a completely different story about who Brett Kavanaugh is. You've earned high praise from the many lawyers, both right and left, who've appeared before you during your 12 years on the D.C. Circuit. And those who've had you as a professor at Yale Law and Harvard Law, people in legal circles invariably applaud your mind, your work, your temperament, your collegiality. That's who Brett Kavanaugh is. And to quote Lisa Blatt, a Supreme Court attorney from the left who has known you for a decade, "Sometimes, a superstar is just a superstar and that's the case with this Judge. The Senate should confirm him." It's pretty obvious to most people going about their work today, that the deranged comments don't actually have anything to do with you. So, we should figure out: why do we talk like this about Supreme Court nominations now. There's a bunch that's atypical in the last 19-20 months in America. Senator Klobuchar's right, the comments from the White House yesterday about trying to politicize the Department of Justices, they were wrong and they should be condemned and my guess is that Brett Kavanaugh would condemn them. But really, the reason these hearings don't work is not because of Donald Trump... It's not because of anything these last 20 months... These confirmation hearings haven't worked for 31 years in America. People are going to pretend that Americans have no historical memory and supposedly there haven't been screaming protestors saying, "Women are going to die" at every hearing for decades. But this has been happening since Robert Bork. This is a 31-year tradition. There's nothing really new the last 18 months. So, the fact that the hysteria has nothing to do with you means that we should ask, what's the hysteria coming from? The hysteria around Supreme Court confirmation hearings is coming from the fact that we have a fundamental misunderstanding of the role of the Supreme Court in American life now. Our political commentary talks about the Supreme Court like they are people wearing red and blue jerseys. That's a really dangerous thing and, by the way, if they have red and blue jerseys, I would welcome my colleagues to introduce legislation that ends lifetime tenure for the judiciary. Because if they're just politicians, then the people should have power and they shouldn't have lifetime appointments. So, until you introduce that legislation. I don't believe you really want the Supreme Court to be a politicized body. Though that's the way we constantly talk about it now. We can and we should do better than this. It's predictable now that every confirmation hearing is going to be an overblown, politicized circus. And it's because we've accepted a bad new theory about how our three branches of government should work -- and in particular about how the Judiciary should work. What Supreme Court confirmation hearings should be about, is an opportunity to go back and do School House Rock civics for our kids. We should be talking about how a bill becomes a law, and what the job of Article II is, and what the job of Article III is. So, let's try just a little bit. How did we get here and how do we fix it? I want to make just four brief points. Number one: In our system, the legislative branch is supposed to be the center of our politics. Number two: it's not. Why not? Because for the last century, and increasing by the decade right now, more and more legislative authority is delegated to the executive branch every year. Both parties do it. The legislature is impotent. The legislature is weak. And most people here want their jobs more than they really want to do legislative work. And so they punt most of the work to the next branch. The third consequence is that this transfer of power means that people yearn for a place where politics can actually be done. And when we don't do a lot of big actual political debating here, we transfer it to the Supreme Court. And that's why the Supreme Court is increasingly a substitute political battleground. It is not healthy, but it is what happens and it's something our founders wouldn't be able to make any sense of. And fourth and finally: we badly need to restore the proper duties and the balance of power from our constitutional system. So point one: the legislative branch is supposed to by the locus of our politics properly understood. Since we're here in this room today, because this is a Supreme Court confirmation hearing, we're tempting to start with Article III. But really we need Article III as the part of the Constitution that sets up the judiciary. We really should be starting with Article I, which is us. What is the legislature's job? The Constitution's drafters began with the legislature. These are equal branches, but Article I comes first for a reason and that is because policymaking is supposed to be done in the body that makes laws. That means that this is supposed to be the institution dedicated to political fights. If we see lots and lots of protests, in front of the Supreme Court, that's a pretty good litmus test barometer of the fact that our republic isn't healthy. Because people shouldn't be thinking they ought to be protesting in front of the Supreme Court. They should be protesting in front of this body. The legislature is designed to be controversial, noisy, sometimes even rowdy because making laws means we have to hash out that we don't all agree. Government is about power. Government is not just another word for things we do together. The reason we have limited government in America is because we believe in freedom. We believe in souls. We believe in persuasion. We believe in love. And those things aren't done by power. But the government acts by power. And since the government acts by power, we should be reticent to use power. And so it means when you differ about power, you have to have a debate. And this institution is supposed to be dedicated to debate and should be based on the premise that we know since we don't all agree, we should try to constrain that power just a little bit, but then we should fight about it and have a vote in front of the American people. And then what happens? The people get to decide if they want to hire us or fire us. They don't have to hire us again. This body is the political branch where policymaking fights should happen. And if we are the easiest people to fire, it means the only way the people can maintain power in our system is if all the politicized decisions happen here. Not in Article II or Article III. So, that brings us to a second point. How do we get to a place where the legislature decided to give away its power? We've been doing it for a long time. Over the course of the last century, but especially since the 1930s and then ramping up since the 1960s, a whole lot of the responsibility in this body has been kicked to a bunch of alphabet soup bureaucracies. All the acronyms that people know about their government or don't know about their government are the places where most actual policymaking, kind of in a way, lawmaking is happening right now. This is not what Schoolhouse Rock says. There's no verse of Schoolhouse Rock that says give a whole bunch of power to the alphabet soup agencies and let them decide what the governance decisions should be for the people because the people don't have any way to fire the bureaucrats. And so, what we mostly do around this body is not pass laws. What we mostly do is decide to give permission to the Secretary or the administrator of bureaucracy X, Y, or Z to make law-like regulations. That's mostly what we do here. We go home and pretend that we make laws... No, we don't. We write giant pieces of legislation -- 1,200 pages, 1,500 pages long that people haven't read. Filled with all of these terms that are undefined and we say the Secretary of such and such shall promulgate rules that do the rest of our dang jobs. That's why there are so many fights about the executive branch and about the judiciary because this body rarely finishes its work -- and the House is even worse... I don't really believe that... it just seemed like... you needed to unite us in some way. So, I admit, that there are rational arguments that one could make for this new system. The Congress can't manage all the nitty-gritty details of everything about modern government and this system tries to give power and control to experts in their fields where most of us in Congress don't know much of anything -- about technical matters, for sure -- but you can also impugn our wisdom if you want. But when you're talking about technical, complicated matters, it's true that the Congress would have a hard time sorting out every dot and tittle about every detail. But the real reason, at the end of the day, that this institution punts most of its power to executive branch agencies is because it is a convenient way for legislators to have... to be able to avoid taking responsibility for controversial and often unpopular decisions. If people want to get reelected over and over again -- and that's your highest goal -- if your biggest long-term thought around here is about your own incumbency, then actually giving away your power is a pretty good strategy... it's not a good life but it's a pretty good strategy for incumbency. And so, at the end of the day, a lot of the power delegation that happens from this branch is because the Congress has decided to self-neuter. Well, guess what? The important thing isn't whether or not the Congress has lame jobs... the important thing is that when the Congress neuters itself and gives power to an unaccountable fourth branch of government, it means that people are cut out of the process. There's nobody in Nebraska... there's nobody in Minnesota or Delaware who elected the Deputy Assistant Administrator of Plant Quarantine at the USDA. And yet, if the Deputy Assistant Administrator of Plant Quarantine does something that makes Nebraskans' lives really difficult -- which happens to farmers and ranchers in Nebraska -- who do they protest too? Where do they go? How do they navigate the complexity and the thicket of all the lobbyists in this town to do executive agency lobbying? They can't. And so, what happens is that they don't have any ability to speak out and to fire people through an election. And so, ultimately, when the Congress is neutered... when the administrative state grows... when there is this fourth branch of government, it makes it harder and harder for the concerns of citizens to be represented and articulated by people that the people know they have power over. All the power right now... or almost all the power right now happens offstage. And that leaves a lot of people wondering who is looking out for me. And that brings us to the third point, the Supreme Court becomes our substitute political battleground. It's only nine people. You can know 'em. You can demonize 'em. You can try to make 'em messiahs. But ultimately, because people can't navigate their way through the bureaucracy they turn to the Supreme Court looking for politics. And knowing that our elected officials no longer care enough to do the hard work of reasoning through the places where we differ and deciding to shroud our power at times, it means that we look for nine Justices to be super-legislators. We look for nine justices to try to right the wrongs from other places in the process. When people talk about wanting to have empathy from their justices, this is what they're talking about. They're talking about trying to make the justices do something that the Congress refuses to do as it constantly abdicates its responsibility. The hyperventilating that we see in this process and the way that today's hearing started with 90 minutes of theatrics that are pre-planned with certain members of the other side here, it shows us a system that is wildly out of whack. And thus, a fourth and final point. The solution here is not to try to find judges who will be policy makers. The solution is not to try to turn the Supreme Court into an election battle for TV. The solution is to restore a proper constitutional order with the balance of powers. We need Schoolhouse Rock back. We need a Congress that writes laws and then stands before the people and suffers the consequences and gets to back to our own Mount Vernon, if that's what the electors decide. We need an executive branch that has a humble view of its job as enforcing the law, not trying to write laws in the Congress’ absence. And, we need a judiciary that tries to apply written laws to facts in cases that are actually before it. This is the elegant and the fair process that the founders created. It's the process where the people who are elected two and six years in this institution, four years in the executive branch can be fired because the justices and the judges, the men and women who serve America's people by wearing black robes -- they’re insulated from politics. This is why we talk about an independent judiciary. This is why they wear robes. This is why we shouldn't talk about Republican and Democratic judges and justices. This is why we say justice is blind. This is why we give judges lifetime tenure. And, this is why this is the last job interview Brett Kavanaugh will ever have. Because he's going to a job where he's not supposed to be a super legislator. So, the question before us today is not what did Brett Kavanaugh think 11 years ago on some policy matter, the question before us is whether or not he has the temperament and the character to take his policy views and his political preferences and put them in a box marked irrelevant and set it aside every morning when he puts on the black robe. The question is, does he have the character and temperament to do that. If you don’t think he does, vote no. But, if you think he does, stop the charades. Because at the end of the day I think all of us know that Brett Kavanaugh understands his job isn’t to re-write laws as he wishes they were. He understands that he's not being interviewed to be a super legislator. He understands that his job isn't to seek popularity. His job is to be fair and dispassionate. It is not to exercise empathy. It is to follow written laws. Contrary to the Onion-like smears that we hear outside, Judge Kavanaugh doesn’t hate women and children. Judge Kavanaugh doesn’t lust after dirty water and stinky air. No, looking at his record, it seems to me that what he actually dislikes are legislators that are too lazy and too risk-averse to do our actual jobs. It seems to me that if you read his 300+ opinions, what his opinions reveal to me is a dissatisfaction, I think he would argue a constitutionally compelled dissatisfaction with power-hungry executive branch bureaucrats doing our job when we failed to do it. And in this view, I think he's aligned with the founders. For our constitution places power, not in the hands of this city's bureaucracy -- which can't be fired -- but our constitution places the policy-making power in the 535 of our hands because the voters can hire and fire us. And, if the voters are going to retain their power, they need a legislature that's responsive to politics, not a judiciary that's responsive to politics. It seems to me that Judge Kavanaugh is ready to do his job, the question for us is whether we're ready to do our job.